In the 18th and 19th centuries, much of Northeast Baltimore was home to farms and wealthy Baltimore merchants’ country estates. Historical state land records show that the area was part of the original “Broad’s Choice” parcel conveyed to John Broad in 1695 by the land office of the proprietor of Maryland. By 1738 Broad’s son Thomas had expanded the parcel to 474 acres, which included all the land within present-day Herring Run Park, between Harford and Belair Roads, as well as portions of present-day Lake Montebello, and the neighborhoods of Northwood and Belair-Edison. In the early nineteenth century, two early turnpike routes leading from Baltimore City to the northeast were created along Harford Road and Belair Road. Dairy and produce farms in the vicinity of these settlements had direct access to Belair Market, which was located in southeast Baltimore. The 1877 Hopkins Atlas of Baltimore County identifies two large land tracts that make up most of present day Arcadia. William Hall’s Eutaw estate was roughly bounded by the Herring Run, Harford and Belair roads, and the location of today’s Weaver Avenue. Thomas Burgan’s property north of the Eutaw estate and east of the Weaver farm became the Most Holy Redeemer Cemetery. In 1908, the Eutaw estate was sold to the City of Baltimore which converted the land into Herring Run Park. In the late nineteenth century Gottleib Heckel, a cobbler on Gay Street moved his family into a log cabin located near today’s Parkside and Prior Avenues. Shortly thereafter, they bought 19 acres of the eastern portion of the Eutaw Farm tract. Gottleib Heckel started building Eutaw Avenue (which became Parkside Drive) from Belair Road to the farm around 1895. In 1902 he laid out and built Heckel Avenue as his driveway. Development in the area north of Herring Run started when the Heckel farm was subdivided in 1898 for a community of 49 single and duplex houses originally called Eutaw Heights. In 1914 Baltimore businessman R. Stanley Carswell purchased 41 acres for a development which he named Arcadia after the pastoral mountainous region of ancient Greece, often represented in literature as an idyllic paradise. Construction began after World War I when the area was annexed by Baltimore City, bringing with it critical connections to the municipal water and sewer systems. The 1918 annexation tripled the land area of Baltimore, and the City was undergoing growing pains trying to keep up with the needs of the new residents. 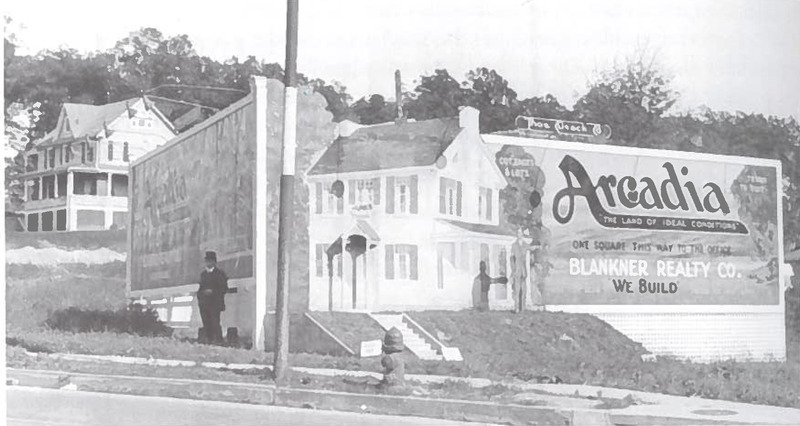 By 1923, enough homeowners lived in the area to form the Arcadia Improvement Association to push for the completion of improvements and basic infrastructure necessary for a quality suburb. Streets had to be laid out, paved, and graded; water and sewer lines had to be extended into the new development; and the area lacked sidewalks. The association also raised $500 to plant trees along sidewalks. They fought for the removal of trolley poles from the center of the Herring Run Bridge, a traffic hazard for the community. There was also a major zoning battle over the development of Eastwood Drive along the edge of Herring Run Park. The activist nature of this improvement association is indicative of the role that residents played in the early twentieth century in shaping their environment. The appearance of their community did not merely rely on the actions of builders, architects, and public officials. Residents utilized zoning as a tool to preserve desirable characteristics of Arcadia. By working with government officials, they influenced park development, traffic safety, and sanitary conditions in their neighborhood. The growth and success of the improvement association allowed residents to be partners with developers and city officials in the building of their neighborhood. In 2002 Arcadia, along with its neighboring community Beverly Hills, was named a National Register Historic District for its historic link with Baltimore’s suburban development and the role that community associations played in shaping the environment of neighborhoods in the early twentieth century. Today, recent archeological digs in Herring Run Park are revealing exciting new information about the early history of the area. The Northeast History Roundtable was formed in partnership with Baltimore Heritage in 2014 to foster knowledge of and appreciation of this area’s rich history. Archeologists Lisa Kraus and Jason Shellenhamer are collaborating with Baltimore Heritage and the Northeast Baltimore History Roundtable on the Herring Run Park Public Archeology Project to identify archaeological sites in Herring Run Park associated with the Hall Springs Hotel and Ivy Hill Plantation. The project team has launched an expanded public archeology project for the site with opportunities for local students, residents and volunteers to learn more about archeology and the history of the park. Arcadia resident and executive director of Baltimore City’s Commission for Historical and Architectural Preservation Eric Holcomb has written a book about the history of Northeast Baltimore, examining the area’s importance as an example of early suburban development.